Learn everything about the controls in this handy PDF. Welcome to SPACETOURS VR, the galaxy’s finest agency for interplanetary travel. Our all-inclusive premium package EP1 offers unlimited travels to the eight planets of the Solar System. Indulge in our fully hipster-style compatible travel pod, taking you to your favored destinations in the blink of an eye. As our ambition as the galaxies finest travel agency is to provide you with the experiences YOU want to see, the path of your journey can be shaped by your desire. SPACETOURS VR also offers an -optional- entertainment program at each location, included in this package. As company during your stay, the discoverers of the respective planets have been fully restaurated and relaunched. 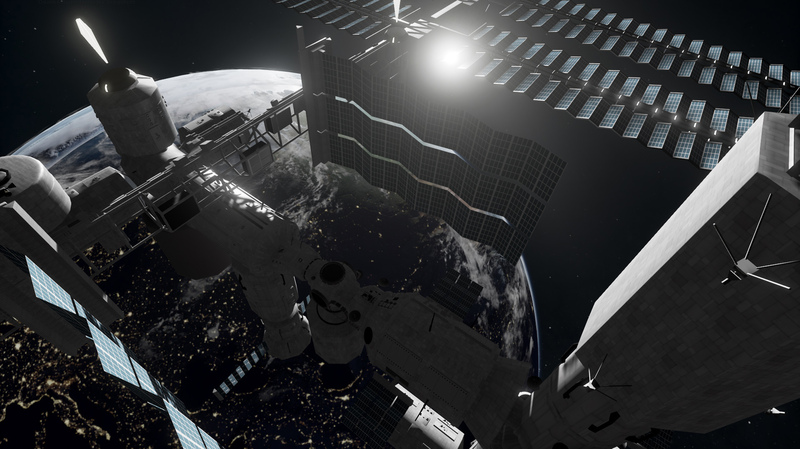 Earth orbit for example offers the first man-made space station, known in history books as the “international space station”, equipped with several vista spots conveniently accessible from your base platform. In the unlikely event of a troublesome encounter, with *cough* Deimos, your beam can also be used to call in weaponised support. Please be aware that SPACETOURS VR does not cover any damage caused by clients on their travels. So leave the world behind and join SPACETOURS VR right now! Lights, sound, music and exploding logo. What more can you expect? Ah yes and don’t sit on the chairs. Really. Don’t sit on the chairs. Your retractable shell offers shelter from the void for the light-hearted, and of course – travel in style. Check out the first man-made object in space SPUTNIK and see the amazing vista points around the ISS. Meet MAVEN, one of the top photographers when it comes to Mars. Avoid DEIMOS, the unstable moon of Mars. If you can’t, well you read about weaponised support earlier didn’t you? Nobody does Saturn like CASSINI-HUYGENS does. For the ultimative dust-ring-sparkle-action, just point your beam at her. You thought the caribbean where the ultimate place to worship the sun? Wait till you’ve been on mercury! A lotion with UV-factor not less then 7e³ is highly recommended. That’s not the Venus I know! See what’s really under Venus’ cloudy facade – MAGELLAN does it right. Wait what?! NEW HORIZONS on Neptune?! Well, where else can you go when your home got revoked planetary status. [ˈju(ə)rənəs] is how it is pronounced. *destinations sorted by visitor popularity.